Try to imagine a total relaxing holiday, in an atmosphere where the quiet is the password, a few steps from the Garda Lake then... You are thinking of Residence Garda Palace! This is the ideal place to spend a carefree holiday with Your family, in new conceived and realized apartments, where the space and the ergonomics have inspired our designers. We are a few minutes far from the biggest amusements parks in the south part of Garda Lake, joy for adults and kids, easy to reach from the highway and the train station. Our staff is always at Your complete disposal to answer to all Your questions and needs. The brand new Residence Garda Palace, since July 2008, is located only few steps from the historical centre of Peschiera del Garda, and close to the main nautical sites and Garibaldi boulevard on the lake. Its twenty five apartments are divided into 3 different categories, according to guests' wish. All the apartments are fully equipped and very comfortable. Type of apartments: 2-room-apartement (composed by: 1 sleeping room, living room with double bed sofa, TV LCD 32”, dining recess with kitchen – completely furnished and equipped with fridge, freezer, 4 electrical plates, microwave, dish washer - bath room with shower); 3-room-apartement (composed by: 2 sleeping rooms, living room with double bed sofa, TV LCD 32”, dining recess with kitchen – completely furnished and equipped with fridge, freezer, 4 electrical plates, microwave, dish washer - 2 bath rooms with shower). The Residence is open all year around and it is a perfect solution for business stay specially during the Fair Season in Verona. A shuttle service is at complete disposal our clients to and from the fair. An exclusive transfer service with Bentley dated 1955 with driver completes our offer. 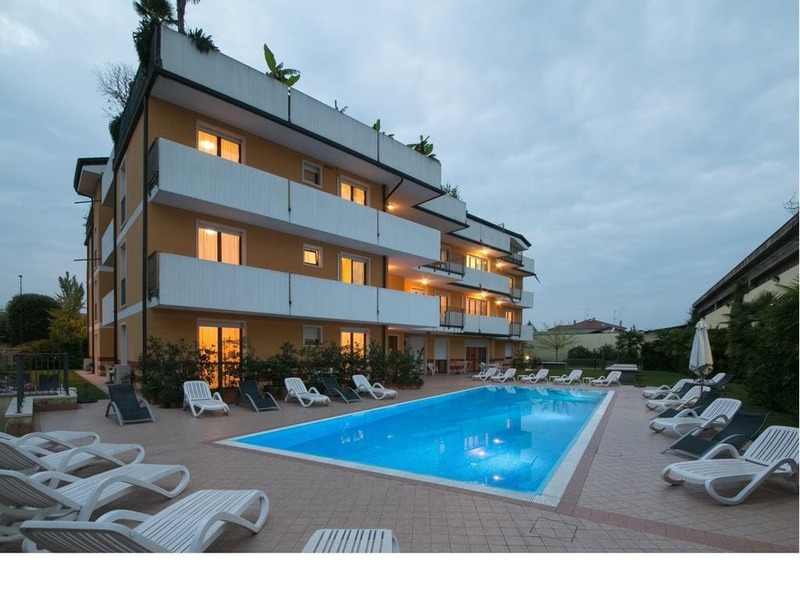 (Residence Garda Palace Peschiera del Garda apartments residence).